The Virgin Atlantic Black credit card is no longer offered. You can compare the best credit cards as rated by LendEDU to find additional options. Virgin Atlantic is a British airline based out of Crawley, UK. They have been in business since 1984 and have been offering international flights to over 30 destinations to consumers across the globe. Aside from great deals on their airfare, they also offer credit cards through Bank of America for their frequent flyers. If you enjoy traveling, you may consider the Virgin Atlantic Black Credit card. All Virgin Atlantic Black credit cardholders will reap extensive benefits with their card. Of course, the most valuable reward that comes along with this card is the miles that you earn with purchases. For people that like to fly, this is really a saving grace on the pocketbook. To earn miles, simply use your card for purchases. With every dollar that you spend, you will earn 1.5 miles. If you use the card directly with Virgin Atlantic, however, you will get 3 miles for every dollar you spend. When opening the card, they reward you greatly with 20,000 bonus miles after you make your first purchase (no matter the amount). Each year, on the anniversary of your card, you will get an additional 15,000 bonus miles, and adding new cardholders will also give you an additional 15,000 bonus miles. If you spend more than $25,000, you are able to get a Virgin Atlantic Economy reward ticket so that a friend can fly with you. Best of all, it will only cost you half the miles! On top of earning miles, you can also get tier points. Each month, if you make at least $2500 in purchases, you earn a tier point. You can earn up to 2 of these points each month, with more tier points rewarded if you fly with Virgin Atlantic or their partners. As you earn points, your status will raise and you will get even more benefits with your card. Cardholders will also receive other benefits, including exclusive access to entertainment and other events, discounts, concierge service, travel assistance and emergency roadside assistance. You will also be able to double manufacturer’s warranties for up to one year on many items that you buy with your card. Pair these benefits with Identity Theft recovery services and purchase assurance for your safety and security and this card seems to stack up. 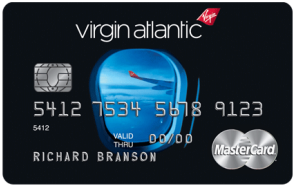 Before you can determine if the Virgin Atlantic Black credit card is right for you, you must first be aware of all of the rates and fees that are assessed with the card. First, there is an annual fee of $90. This is a fee that is applied each year to keep the card current and active. When you first open the card, it will be charged to your available credit. The APR for all purchases and balance transfers will vary, based on Prime Rates, from 12.49% to 19.49%. It will also depend a lot on your own creditworthiness. Cash advances have a higher annual percentage rate, at 15.49% to 22.49% for direct deposit or check advances and 25.24% for cash advances originating at a bank or financial institution. Paying your bill on time each month is really important with this card (and all credit cards, really). If you make a late payment, your interest rate could raise to up to 29.99% as a penalty APR. If this happens, chances are it will remain your APR for as long as you have the card. Aside from paying more in interest fees, you will also be subject to penalty fees of up to $37 if you have a late payment, and $27 if you have a returned payment. Other fees that may be applied to your card include fees for balance transfers and cash advances. Balance transfers come with a fee of either 3% or $10, and cash advances range from 3% to 5% or $10, whichever is higher. If you use your card to protect you from going into an overdraft with your checking account, you will also pay a $12 fee per transaction (as long as it is more than $12 overdrawn). If you consider everything, the Virgin Atlantic Black Credit card seems ideal for most, especially if you love to travel. The annual fee is low, compared to many of the other cards that offer similar sky miles programs. The interest rate is reasonable. There are no foreign transaction fees for purchases made out of the country. These all make this a good card, and we definitely recommend it.